We recently announced that album changes were coming soon. Well, the time has come. In a continuous effort to meet current demand, we’re simplifying our line to make it that much easier when ordering. But rest assured, we will continue to offer our top sellers while making several quality enhancements along the way. We will continue to offer our most popular Premium Leather cover options but are switching to a higher-quality leather product than what’s currently offered. 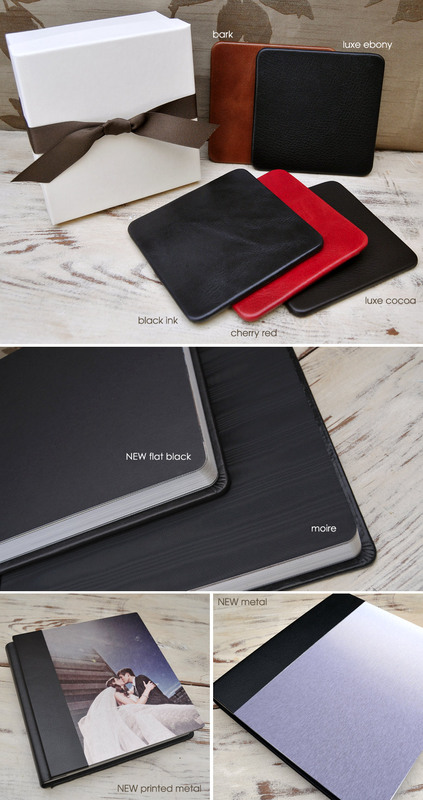 These colors include: Bark, Black Ink, Cherry Red, Luxe Cocoa and Luxe Ebony. This means we will discontinue some of the lesser in-demand colors, including Bronze, Rainforest, Sable, Luxe Bone, Luxe Indigo and White Crocodile. 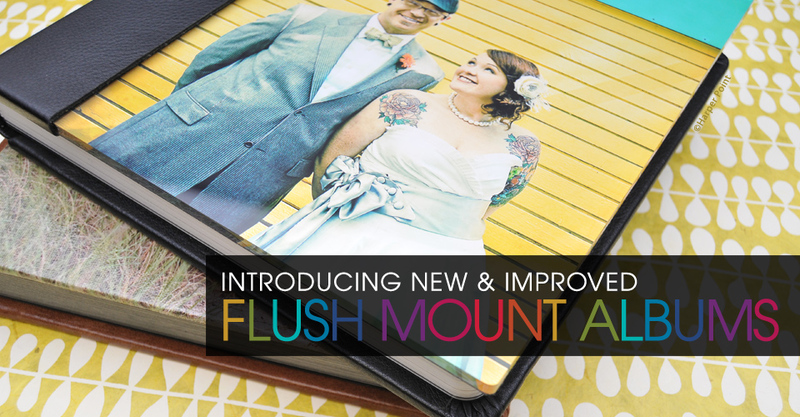 In addition to the Moiré End Leaf we currently offer in our Flush Mount Albums, we’ve added a Flat Black End Leaf for a simple yet modern alternative. We are excited to offer a Printed Metal cover. Your image is printed directly onto a metal substrate for a modern, edgy album. If you’re looking for a metal option without the print, try our new flat Metal cover for a contemporary look and feel. The Brushed Aluminum, Brushed Copper and Etched Aluminum covers will be pulled from the line in place of the Printed Metal and Metal options. The Crystal Clear Acrylic cover, the most popular option of this category by far, is the only acrylic now offered. We’re discontinuing the Rain and Tonic Acrylic covers. For Premium Leathers: 5×5 sample swatches are available of the five leather types. Order one for $10 or a set for $45. They’ll be available soon through Billable Supplies. Because they are a billable supply item, you will be responsible for shipping fees. For Metals and Crystal Clear Acrylic: Upload your own image for a custom 10×10 sample of the Printed Metal and Crystal Clear Acrylic covers. Price is $100 per cover. Order now in ROES. Q: I’ve already sold my client a cover that is going to be discontinued. Can I still order this cover? A: Yes, we will do our best to fulfill your order, as we will have limited supply to honor any presold albums. Because supply is limited, we can’t guarantee the cover will be available. We will do everything possible to make this transition as smooth as possible for you and your client. Q: I’ve already ordered my studio sample with one of the leathers/covers you are discontinuing. Can I send my album in to be recovered with one of the new options? A: Yes, if you’ve ordered your sample within the last six months simply return your album to the lab accompanied by your design on CD and a note indicating which covers you would like and we will take care of the replacement for you. Additional charges may need to be added for cover upgrades. If you have any questions about the new premium cover options now in place, please contact Customer Service at custserv@millerslab.com.